Gallery art: Getting ready for November? Save the date to join us at Gallery art in West Tampa for recent works from George Anderton. The evening is sponsored in part by Cigar City Brewing. Also for one night only in the reception area catch new work from Robb Fladry! Yahoo! Hold on to your hats. It's going to be a great exhibition. Opening Reception :: Friday November 6th :: 7-10pm ::Come out and support these artists! 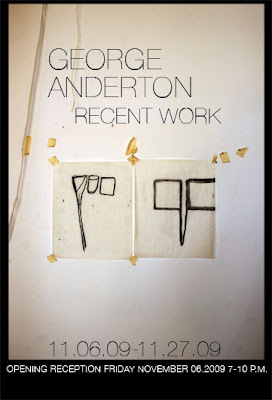 Not familiar with George Anderton but that flyer looks dope! I'm definitely planning on coming! Can I bring my camera and take some photos of the reception? I'd love for you to take photos! Lately I have been too busy to take photos at the reception, so YES, as long as you share! You'll LOVE George's work. He's awesome. One of my very favorites!